Wales and Ospreys scrum-half Mike Phillips is no stranger to the headlines with a recent altercation at Rodney Parade and his region's agonising exit from the Heineken Cup boosting his Google numbers for all the wrong reasons. So we thought we'd cheer the British & Irish Lions international up a little with the news that he still warrants a place in our latest Scrum Seven featuring the best players to have worn the Welsh No.9 jersey. Why not start at the top? Edwards is as close to a folk hero as you'd find in Wales, a talismanic figure who defined their glory era of the 1970s. 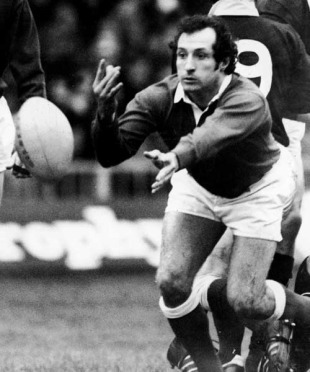 With two of the greatest fly-half partners of them all, first Barry John and then Phil Bennett, Edwards commanded backlines in the red of Wales and the Lions, in the victorious 1971 and 1974 series, that would not look out of place in an all-time great list. Lightning fast, with a dive pass that was poetry in motion, he's Wales' claim to having produced the finest player of them all. And there was that try for the Barbarians, which still gives us shivers. Precocious teens aren't alway the most popular of figures, but Tanner wrote a chapter in Welsh rugby history while still a schoolboy at Gowerton that has lived long in the memory. With the national side seemingly physically unable to conjure a win over the All Blacks, Tanner's double victory in 1935 is constantly revisited. Alongside fellow schoolboy Willie Davies he inspired a famous 11-3 win for Swansea at St. Helen's before making his Test debut against the same opposition in Cardiff. The score was 13-12, etching Tanner's name into the history books and setting up a career that would see him lead Wales with distinction. Bleddyn Williams, the 'Prince of centres' and a team-mate of Tanner's said, "Among all the scrum-halves I've seen and played with, he would reign supreme." Cardiff's Holmes had the unenviable task of succeeding Edwards as Wales' No.9, and did so by offering a wholly different skill set. Tall and brutally powerful, Holmes scrapped and cajoled behind a 1980s pack that was often seen under severe pressure. Had his career not been blighted by a series of injuries he would have taken home far more plaudits than he did, with his double injury nightmare on tour with the Lions in 1980 and 1983 a crying shame. Following his final Test cap against Fiji in 1985 Holmes 'went north' to join rugby league side Bradford Northern, but his time in the professional ranks was also cruelly curtailed by injury after only 40 games. Another brilliant scrum-half who scrapped behind an under-strength pack, Jones was a classical player who espoused the basics of the game. His pass was precise and missile-like in its execution, taking pressure off fly-half Jonathan Davies, with whom he formed a strong partnership before the latter's switch to rugby league. Jones helped Wales to a surprise third place at the 1987 Rugby World Cup, but it was in 1989 when his career hit a peak. He played all three Tests for the Lions in Australia, battling with the Wallabies' cerebral skipper Nick Farr-Jones, as they won their first series since 1974 and the 'Invincibles' in South Africa. Howley was a talismanic figure for Wales during the lean years of the 1990s, his wit and invention matched by precious few among the Welsh ranks. His wonderful solo try against France in 2001, breaking clear before dummying the remaining defenders, epitomised his pace and speed of thought. In 1997 he was ruled out of the Lions' series with South Africa while in pole position for a Test jersey, but finally got his hands on a red shirt in 2001 under the tutelage of Wales coach Graham Henry. Still, his finest moment arguably came in the colours of Wasps as he nipped in to embarrass Toulouse's Clement Poitrenaud in the 2004 Heineken Cup final. A seminal moment for a player who missed out on a great deal of success during his career. Peel had a vintage year in 2005. An experienced international player by the time of the Six Nations, his performances on the way to a first Grand Slam since 1978 brought recognition with the Lions in New Zealand. His strength was in his ability to break from a ruck, his pace and strong offloading game fitting seamlessly into Wales' thrilling, if unsustainable, running gameplan. He was also one of the few player to emerge from Clive Woodward's nightmarish tour with anything resembling his reputation intact. If Peel was the natural successor to Howley, then Phillips was Holmes' second coming. At 6'3'' and 227lbs, Phillips offered something different to the sparky Peel, although he took some time to hit peak form at international level. A high-profile false start against New Zealand at the Millennium Stadium in 2005, while Peel was out injured, set his hopes back but a move to the Ospreys reignited his ambition. He got short shrift under Gareth Jenkins despite excellent form, coming into his own under the guidance of Warren Gatland. He started and ended Wales' 2008 Grand Slam as first choice, his running and passing game coming into line with his aggressive breakdown work, and he completed a trio of Welsh Lions scrum-halves in 2009.